I can’t really think of a more appropriate way to start the Bout of Books 11 read-a-thon than to post a couple of reviews? I’m a bit behind, so please bear with me. Stenson’s Fiend is about a guy Chase. He’s a junkie living in what’s basically a slum on the outskirts of the Twin Cities. His parents are from the burbs and haven’t really been equipped to help him in years. He and his best friend Typewriter have been binging and going on serious benders since Chase’s girlfriend dumped him and he fell off the wagon. In the midst of a week long meth binge, the two see a little girl outside. She seems happy and is giggling. Then, the little girl rips out a dog’s throat, spots them, and heads towards the house. The two freak out. The little girl is breaking in and they want to believe it’s all just a halluciation. It’s worse. The world is ending. Zombies have taken over. Only Chase, Typewriter, and a handful of junkies are left to try and survive. Stenson is very dependent on his reader’s knowledge of the Twin Cities. He often mentions locations by name rather than giving in depth descripitions. This is a double edged sword. As a resident of the Cities, it was interesting to be able to know exactly where they were supposed to be. However, it also made descriptions stand out when they weren’t quite right. Additionally, Stenson describes locations that are wrong. Frogtown isn’t all rambler housing and isn’t as big as Stenson describes. West Seventh is a bit run down but isn’t junkie city, at least not as close to Grand Avenue as he mentions. The Groveland Tap isn’t really the kind of place that a lot of meth heads gravitate to. I’d also think that if I were a non-resident of the cities, I would have been a bit lost in the locations. It would have distracted me or been confusing. I liked a lot of the supporting characters, especially Typewriter. The side characters are very well fleshed out. They’re sympathetic and believable. I thought that Stenson does a good job showing how they’re both kind of normal but also incapable or dealing with the things in their life that cause them stress or lead to chaos. They were well balanced. Chase, the narrator, was a bit disappointing. He was pretty insightful when it came to his friends, but the narration doesn’t really show a lot about Chase’s past or his development. It’s clear and believable when showing how he can be abusive, manipulative, or running on survival mode. There are some moments of vulnerability, where Chase says things that hint at his past and who he feels he once was, but those moments didn’t resonate with me, largely because we don’t see who he thinks he was. There were tons of zombies though. They were flesh worn and giggled. Pretty creepy. In the first twenty pages or so alone there are three attacks. Very fun. I did like the ending quite a bit. It was fitting, but that’s all I’ll say. I enjoyed the book. I just wish there had been a bit more to some of the characters. Also the location thing I think is going to screw some folks up. 3/5. 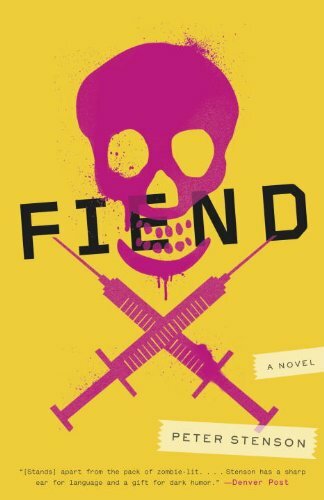 This entry was posted in Reviews and tagged Books, Fiend, Horror, meth, Peter Stenson, Review, Zombies.